It is vital to keep your bones healthy throughout life. Healthy bones provide a strong foundation, allowing mobility and protection from injury. They also serve as a bank for important minerals, such as calcium, that help support numerous organs in our body. 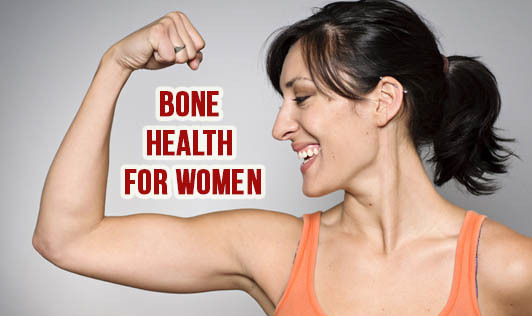 Bone health in women is a pressing issue as a woman’s bone is by nature less dense. A woman must be careful about the food she eats and her general state of health to make sure that her body is not deprived of vital nutrients critical to good bone health. Your diet must include calcium, phosphorous, magnesium, and potassium because these are the most important nutrients critical to good bone health. Good sources of these nutrients include dried pulses, green leafy vegetables, dairy products, seafood, whole grains, fruits, and nuts and seeds. Another factor which affects bone health is Vitamin D. This vitamin is available through sunshine. It is one of the key elements important for optimum bone health. Health experts agree that sunshine and regular exercise are a good combination to ensure proper bone health. Brisk walking or any outdoor exercise is recommended in order to promote good bone health. Most bone-related problems in women occur after their menopausal period. It is even more critical that a woman exercises to keep her bones in good health. Suggested exercises include lifting small weights. Another factor that can affect bone health is posture. Most women, especially when they are young, do not pay attention to posture, not knowing that the consequences later could be severe. Ensure that your posture is right most of the time.